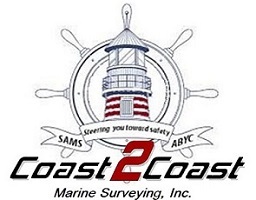 Welcome to Coast2Coast Marine Surveying, Inc. services information page. We are a premier provider of Marine Surveying and Marine Infrared Technology. Our goal is to provide the very best in Marine Inspections using the finest equipment and techniques. Because our attention to detail and quality control standards are high, our surveys are among the best in the business. We use ABYC, NFPA, and USCG standards in all our surveys. Our goal is to deliver the most comprehensive and thorough survey so you can make the best informed decision. We want to "Steer You Toward Safety", and we want you as a valued customer, not just for your first vessel but your next one as well. Here is a list of our core services. This is the most comprehensive type of inspection, and is strongly advised when purchasing a new or used vessel. Condition and overall operation of the vessel should be examined. This covers structural integrity, electrical systems, the propulsion system, the fuel system, other machinery, navigation equipment, miscellaneous onboard systems, cosmetic appearance, electronics, and overall maintenance as well as an out of water inspection and a sea trial. Infrared (IR) Thermal Imaging is not only used for night navigation, it has become one of the most popular and sought after services customers want with their survey. This technology supports the already tried and true percussion testing methods and the nondestructive moisture meters used to isolate delamination in Glass Reinforced Plastic (GRP) also known as fiberglass. IR is also used for inspecting the electrical system looking for hot spots in corroded conductors, poor connections and faulty equipment or appliances. 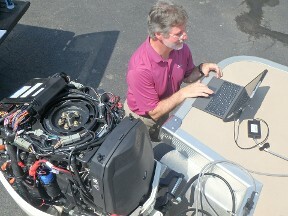 In the engine room, IR is used to compare temperature differences among mechanical components during the sea trial. Additionally thermal readings will be used to identify issues with the engine cooling system, exhaust system as well as the air conditioner/reverse cycle heat pumps. 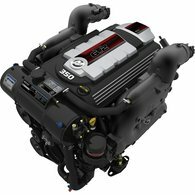 We utilize the latest technology in Marine Engine Computer Analysis to provide our customers a full diagnostic test of each engine. Included in the survey report is a comprehensive report for each engine detailing everything from the number of hours on their engines to the last time the oil was changed. If there's ever been an issue with an engine, a fault code will be recorded and stored in the Electronic Control Module (ECM) memory. The diagnostic report will show run history, fault codes and live recordings of EFI data and engine performance. • "Are my shaft anodes corroded?" • "Is my bonding system working?" • "Are the boats next to me producing stray current?" • "Is my galvanic isolator working properly?" • "Is my boats electrical devises working properly?" • "Is there stray current either in my boat or around my slip?" • "Do I have enough anode protection?" • "Is the marina shore power grounded properly?" Our Ultrasonic and Dye Penetrant testing services are available for steel and aluminum hull vessels. We can include this service into the pre-purchase survey or as needed. Oil Analysis, TestingWe recommend a complete oil analysis for all types of engines, gas or diesel with your pre-purchase survey. The oil analysis is a reliable method to gauge the health of an engine or gearbox, simply by looking at what's in the oil. All oil sample analysis will be included in your survey report or emailed directly to you as a separate report.